Do you need a special meal for Thanksgiving, but not enough people around to warrant roasting an entire turkey? There is nothing wrong with that, and I have been in that position before. While it’s not the best scenario celebrating the holidays without extended family, making a special meal is sometimes better than going out. Our first Thanksgiving away from family was the worst on record, and I never want to experience that again. We lived in a tiny city in Texas and the only place open that day was a buffet – yuck! We had no choice because I didn’t cook back then like I do now…live and learn, right? Heat 2 quarts of water in a small pot. Once the water simmers, add your salt and sugar – stir until dissolved. Allow to cool for 5 minutes. Meanwhile, rinse your chicken and remove anything inside the cavity (giblets, liver, ect). 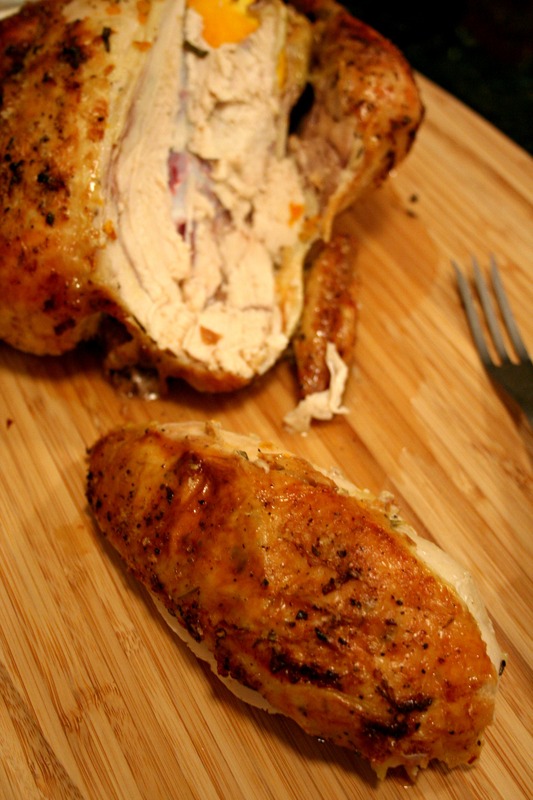 Place your chicken in a large lidded container (mine holds 6 quarts of liquid) or a heavy-duty plastic bag. Add the citrus, garlic, spices and herbs. Pour the cold water and then the dissolved salt/sugar mixture. Cover and refrigerate of 8 hours or overnight. 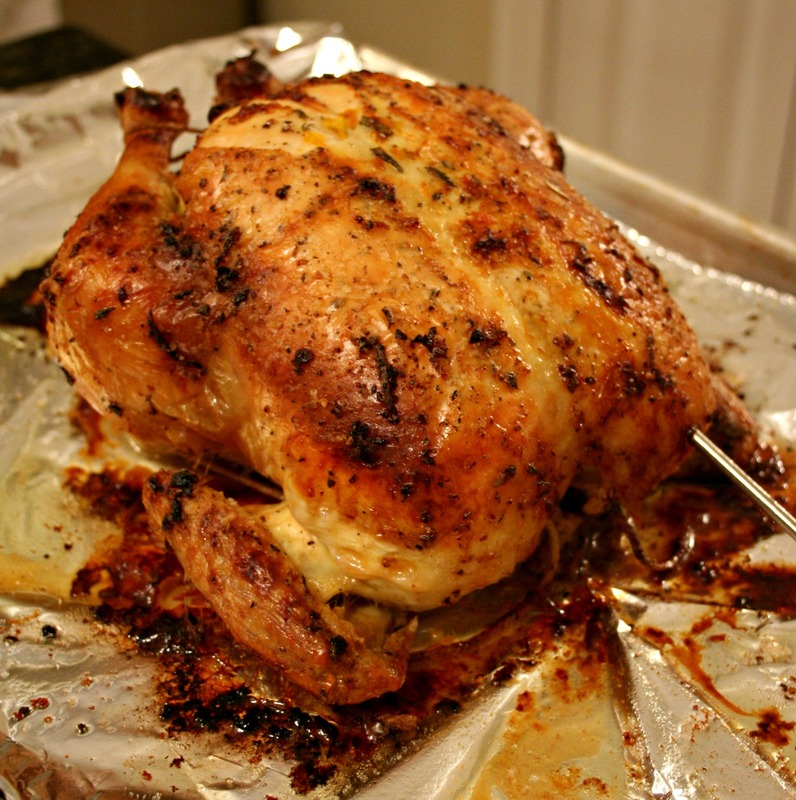 *About an hour before roasting, take the chicken out of the brine and pat it dry with paper towels. Set it on a sheet pan and place it uncovered in the refrigerator so the skin can dry out a little. Place butter in a small bowl. Using a fork, mash until softened. Add salt and pepper and mash to incorporate. Add olive oil, zest and rosemary and stir to combine. Preheat oven to 400 degrees. Place the other half of lemon and orange in the cavity, and garlic or shallot if you have it. Truss chicken and coat generously with the citrus butter. Add salt and pepper to taste and place in roasting pan or a foil lined sheet pan; insert probe thermometer into the thickest part of one of the breasts. Roast the chicken until the thermometer reads 155-160 degrees, (about 70-75 minutes with my convection roast setting). Once the desired temperature is reached, loosely cover with foil and let rest for 15-20 minutes. Carve, serve and enjoy!